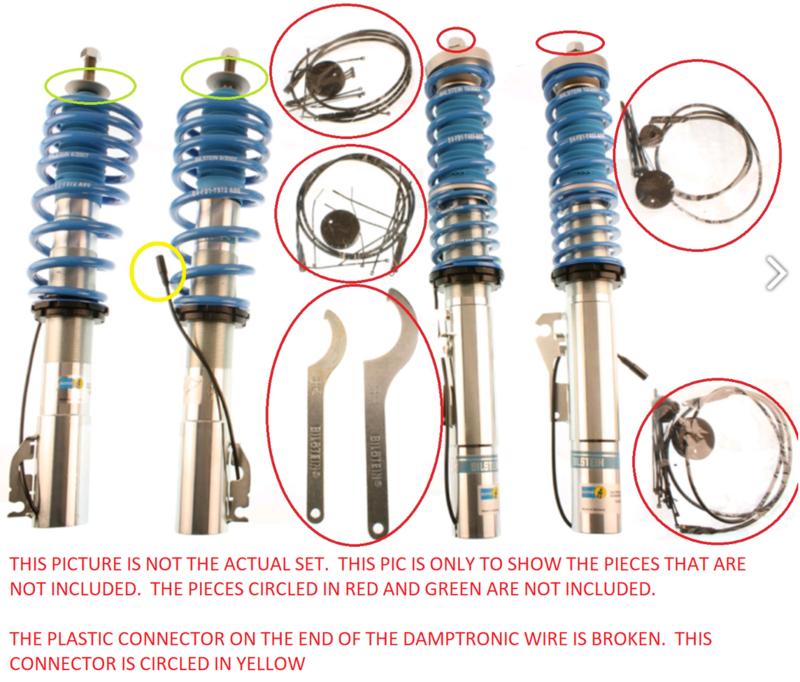 This is a USED set of coilovers that are fully functional. However, there are some missing parts and a broken plastic connector. Details below. Please look at the pics closely for condition. One of the plastic connectors for the Damptronic wires is broken, and needs to be repaired. There are several pieces missing from the complete kit. The picture that has parts circled in RED and GREEN are missing parts, and not included. This picture is not the ACTUAL pieces, it is only to show what is missing from the full kit. The connection clip that is circled in YELLOW shows the clip that is broken. There is also a close up of the actual broken clip. FYI - ebay is running a promotion today that will deduct another $100 USD from the price, if purchased on their phone app before 700pm PT today.